Clemson isn't all about football. The Tigers are pretty good at basketball, too, and are going to the Sweet 16 for the first time in 21 years. 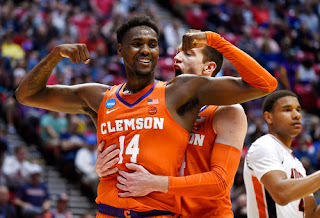 Gabe DeVoe scored 22 points and Elijah Thomas had 18 points and 11 rebounds for Clemson, which closed the first half with a 25-4 run that helped it beat cold-shooting Auburn 84-53 on Sunday and advance to the Midwest Region semifinal. "I think it's a statement game," Clemson guard Marcquise Reed said. "I think we showed how hard we can compete defensively. I think it's a real good game for us moving forward." In a matchup between Southern schools better known for football — Clemson won the national championship two seasons ago — the No. 5 seed Clemson Tigers proved far more adept on the hardwood than the No. 4 seed Auburn Tigers. The blowout win put Clemson (25-9) into the Sweet 16 for the fourth time overall and the first since 1997, earning it a spot against Kansas in the regional semifinal. It was a humbling end for Auburn (26-8), which played this season under the cloud of a federal investigation into corruption in college basketball. The final 10½ minutes of the first half were a nightmare for Auburn, which made only 6 of 33 shots (18.2 percent) in the first half and 17 of 66 overall (25.8 percent). "I really don't know where we lost our focus," Auburn guard Bryce Brown said. "All I can really honestly remember is they had a few stretches where they came down and knocked down shots and we had a few stretches where we came down and took kind of bad shots at times and that led to easy fast breaks for them." Jared Harper made a jumper with 10:33 before halftime to pull Auburn to 18-15. The Tigers then missed their next 18 field goals as Clemson raced to a 43-19 halftime lead. Clemson scored 17 straight points, highlighted by 3-pointers by Anthony Oliver II and DeVoe, to make it 35-15. Chuma Okeke made two free throws for Auburn, but the Tigers still couldn't hit a field goal. They got two more free throws by Mustapha Heron with 1:20 to go. Auburn finally snapped the drought from the field when Bryce Brown hit a 3-pointer 44 seconds into the second half. All that did was pull the Tigers within 21 points. "I felt like they had a couple of good looks and they weren't able to knock them down," DeVoe said. "But we play well defensively like that. The easy looks don't go in all the time. I think pressure and our defensive intensity really bottled them up offensively." The drought "was just bad for us early and it affected what we could do offensively and defensively," Auburn's Jarred Harper said. "We just got away from playing offense together and playing defense together," Davion Mitchell said. Heron and Bryce Brown scored 12 points apiece for Auburn and Horace Spencer had 10. Reed added 16 for Clemson and Shelton Mitchell had 10. The rout was so complete that Clemson subbed in two walk-ons for the final two minutes. "I don't know how long since we've been to the Sweet 16, but I know for a fact this won't be the last time," Oliver said. "We have a special group of guys, not only for this year but for next year and the year after that." Clemson made 10 of 26 3-pointers. DeVoe made 6 of 9. Auburn heads into an uncertain offseason. Assistant coach Chuck Person was indicted as part of a federal investigation that cost two of Auburn's best players their eligibility. Person was accused of accepting bribes to steer players to a financial adviser once they turned pro and funneling money to the families of Austin Wiley and Danjel Purifoy. Neither played this season. The 25 wins ties Clemson's school record. ... This was Clemson's largest margin of victory in the NCAAs. The previous largest was an 83-70 win against Saint Mary's in 1989. Clemson plays top-seeded Kansas on Friday in Omaha.